The GFB DV+ can actually be configured in two different ways depending on your own personal preference and what you want to achieve. During assembly, you can choose to install the main piston spring (indicated below by the arrow) or not. Using the spring is recommended because it results in the best possible throttle response and minimum lag on gearshift, particularly on manual cars. This can sometimes result in a slightly different sound from the intake at low RPM, which is no cause for alarm – it’s simply the different way in which the valve works. If however the noise is objectionable, removing the spring will make the DV+ operate the same way as the factory valve, albeit at the expense of throttle response. To explain further, minimum lag on gearshift on any petrol turbo engine is achieved when the diverter or blow-off valve vents only just enough air to prevent compressor surge. Venting more air than necessary increases lag on gearshift because the intercooler is completely relieved of pressure, meaning it takes longer to return to peak boost when the throttle is re-opened. This is the basis behind GFB’s TMS principle (as explained in this article here), and is also the principle that all GFB valves operate on. 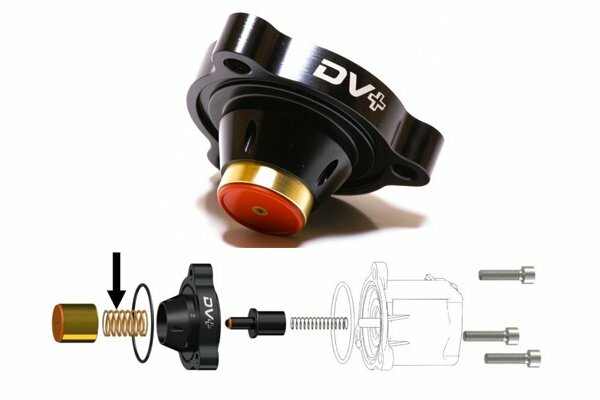 The DV+ is no exception, because unlike the factory diverter, the DV+ opens and closes in response to both the ECU command AND the amount of boost pressure in the intercooler. So when the ECU triggers the solenoid, the DV+ piston will only open as far as the boost pressure in the intercooler can push it against the spring. The factory diverter on the other hand will simply open regardless of the boost pressure. The different sound you may hear on throttle lift-off at low RPM is simply because of this different operation method, and it does not adversely affect the turbo or engine. Removing the spring means the DV+ piston will simply open and close when directed by the ECU, just as the factory diverter does. Rest assured that even with the spring removed, the DV+ will still continue to hold boost normally, however you will forfeit the benefit of the TMS principle and throttle response will be the same as with the factory diverter. Next PostTMS Respons: Don’t throw your GT-R boost away!